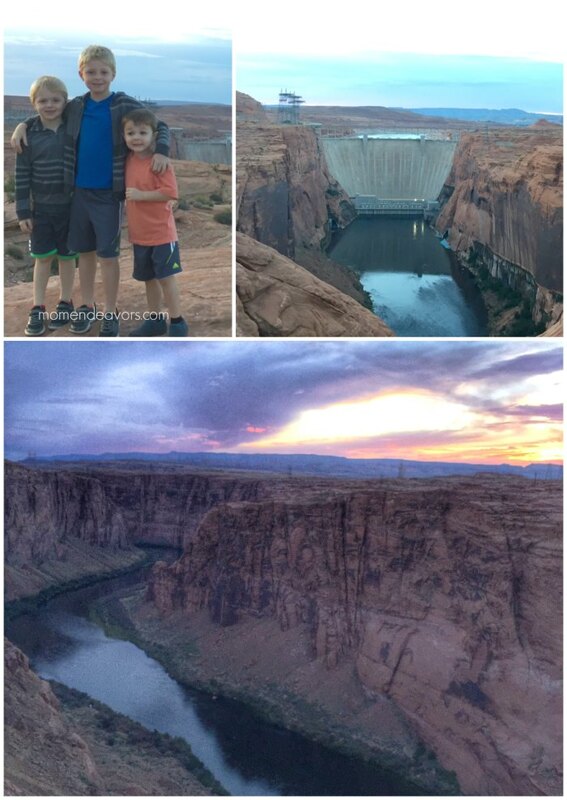 If you’re planning a National Parks trip to the desert southwest or you live in Arizona, Las Vegas, or Utah, a family trip to Lake Powell should definitely be on your list! The area is so scenic and unique, with some incredible outdoor adventures to be had! Living in Arizona, we have the benefit of being within a 6-hour drive of some incredibly diverse places/landscapes and Lake Powell is no exception. At just about 4.5 hours from our home in the Phoenix area, a trip to Lake Powell (Page, Arizona) is an easy road trip almost straight north! The trip takes about the same time from Las Vegas and about 6 hours from Salt Lake City (and only about 2 if you’re visiting Zion in Utah). 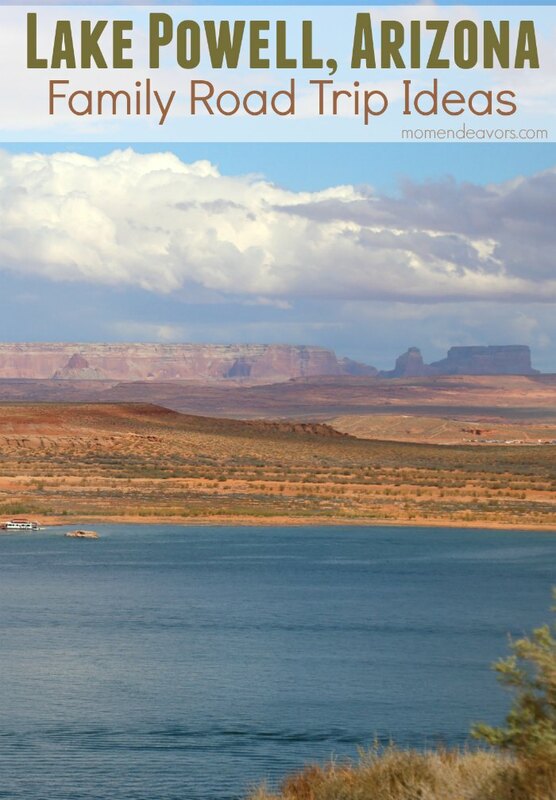 So, a visit to Lake Powell when you’re in the area really is a fabulous idea! To maximize our time in Page, we left Phoenix on a Friday night and spent the night in Flagstaff. It’s an easy two hour drive nice and is about half-way between Phoenix and Page. We got up first thing on Saturday morning and drove up to Page. Keep in mind that a good portion of this drive is through the Reservation and there is NO cell service (and NO services – no rest areas, gas stations, etc). So, keep that in mind as you leave Flagstaff. 1. Lower Antelope Canyon- Personally, I think Antelope Canyon alone is worth the trip to the area! This was INCREDIBLE – so much so that it’s going to have it’s own post! This is a MUST do! So, plan ahead and make sure you get signed up for a tour for at least one of the canyons (Upper or Lower). 2. 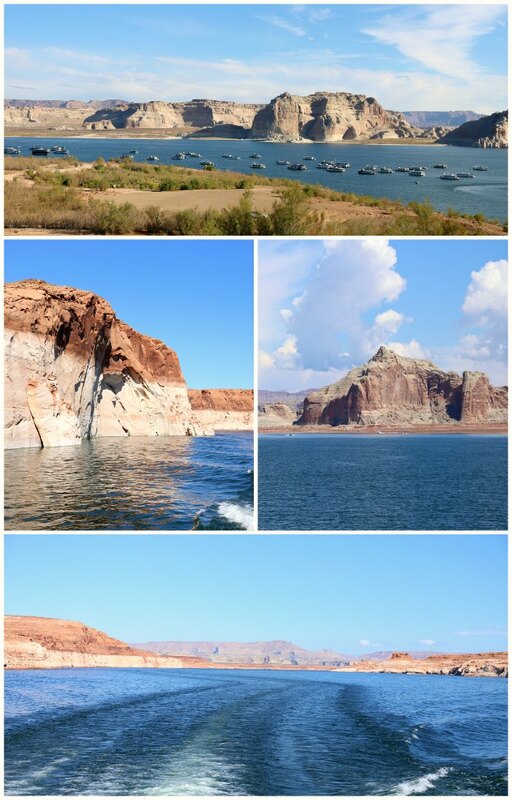 Boat Trip on Lake Powell – We did the Canyon Adventure Boat Tour, booked at Lake Powell Resort (where we were staying). This particular tour was about 2.5 hours and showcased highlights on the lake like Glen Canyon Dam, Antelope Canyon, Navajo Canyon, Navajo Sandstone. There were headsets available in different languages on the boat with all kinds of different information on the places we were seeing. So, it’s great & educational for all ages. There are a number of lake tour options as well – even one that you can take for a trip to the famed Rainbow Bridge. 3. 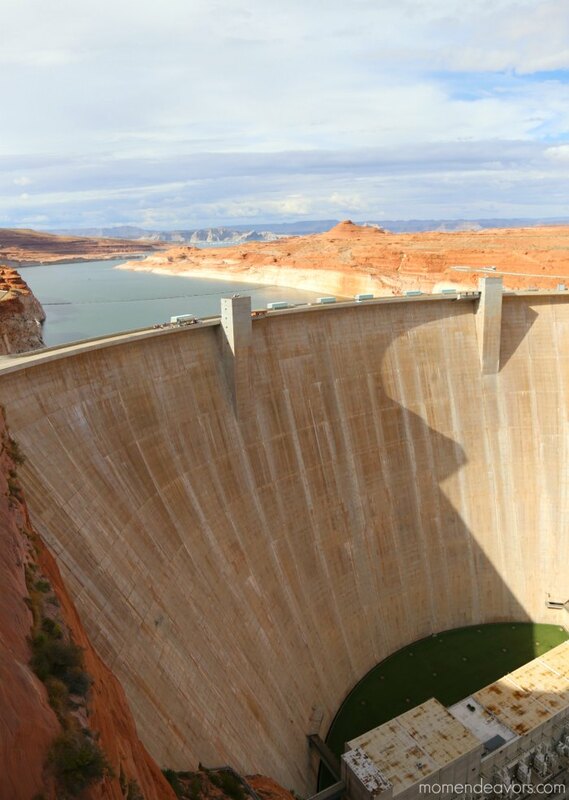 Glen Canyon Dam – You’ll have drive over the Glen Canyon Bridge right next to the dam to get to Lake Powell Resort or the water activities on the lake anyway, so might as well stop at the Carl Hayden Visitor Center and walk the bridge to have a look at the dam. The bridge is completely fenced, so there is no danger there. There are also some look-outs behind the Visitor’s Center. Inside the center, you’ll find some information, a video, a gift shop, and you can even sign up to take tours of the dam! An educational stop for sure. 4. Horseshoe Bend – Perhaps the most famous view of the Colorado River is found just outside of Page, Arizona – just a few miles south of Lake Powell. 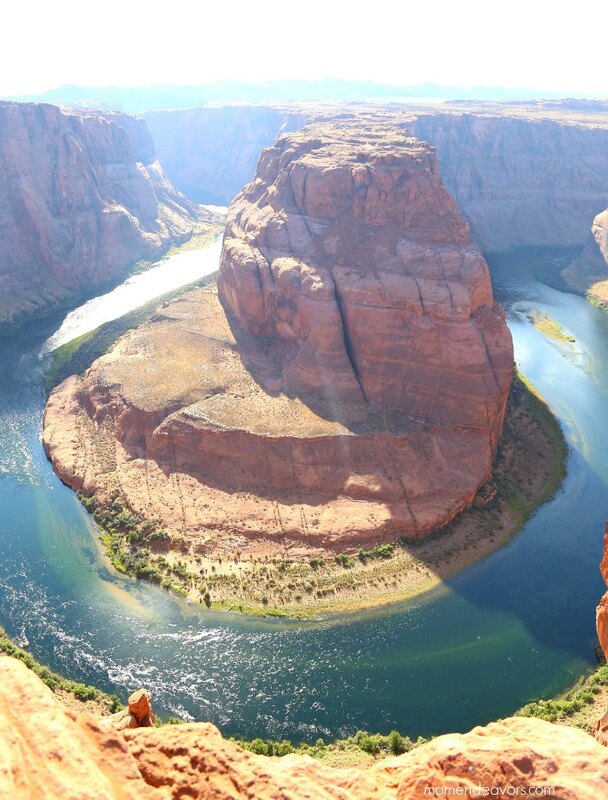 Horseshoe Bend is an incredible sight and must-see if you’re in the area. The fairly easy desert hike to the overlook is about 1.5 miles round trip from the parking lot. Parking is free and there are no facilities there (so keep that in mind). If you’ll be there with kids, you’ll need to use an abundance of caution. There are NO fences, no guard rails – NOTHING to prevent you from falling off a 1,000 ft. sheer cliff face. We did it with our 3 young boys, with the my husband and I taking turns having a look over the edge and the kids physically attached to the other adult (holding hands, etc) at ALL times. It was worth it for that incredible view – just be SO careful! 4. Scenic View Road & Glen Canyon Overlook Trail- Just off Highway 89 just a little before you come to the bridge, there is a turn off for Scenic View Road. The road takes you to a turn off for the Glen Canyon Overlook. There’s a little parking lot and trail – and a great spot for sunset!!! You get gorgeous views of the dam and the river from here (and there are some guard walls in some places, making it feel a bit less dangerous with kids than Horseshoe Bend). 5. 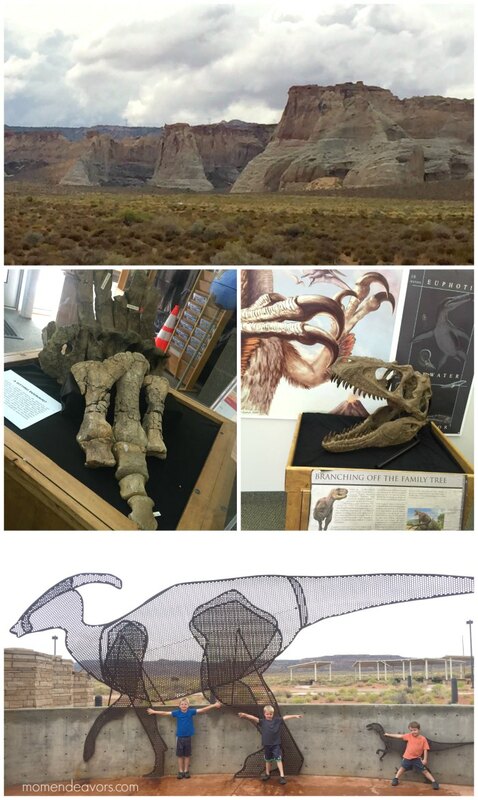 Fossils & Dinosaurs at Big Water Visitor Center in Utah If you have kids the love dinosaurs, you want to venture into Utah a little, or you’re on your way to Zion, a stop at the Big Water Visitor Center for Grand Staircase – Escalante National Monument is fun! It’s only about a 20 minute drive from Page, Arizona – maybe only 15 miles across the border in Utah. Not far from the visitor’s center, an almost complete fossilized skeleton of a whole new species of dinosaur was found. The man who made that discovery is often there working at the center, so it’s a really unique experience. The center is not big, but it’s a still a fun little, educational stop – especially if you have dinosaur-lovers! 6. Into the Grand – dinner & show Into the Grand is a fun, family-run establishment. They’ve got a small Colorado River Museum area inside the building and each night, you can enjoy dinner & a show there! In fact, currently, they’ve got the #1 restaurant spot on TripAdvisor in Page. The show menu includes different varieties of Navajo Tacos as the main dish, though there are some other a la carte items as well. There is a bit of music before and during dinner. Then, the show features some Native American dances from some of the young people there in the area. 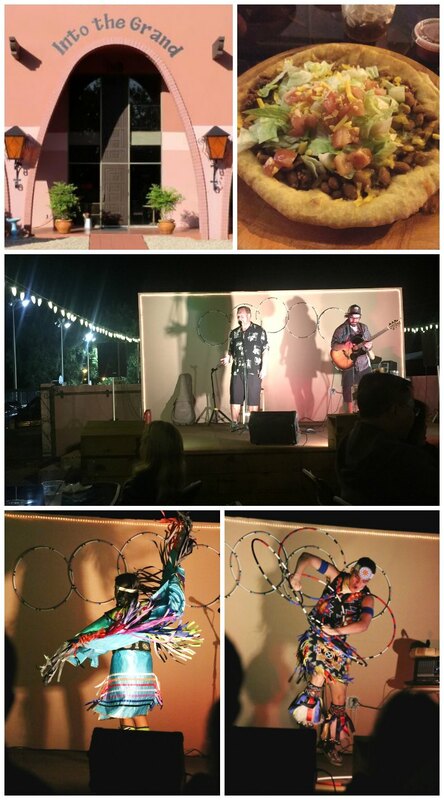 It was a great way to spend a evening in the area – super unique and I love supporting small, family business like this! So plan for that if you’re in town (reservations are recommended, so do plan ahead)! See?! Some great sights to see in the area! We spent just over 24 hours there in Page/Lake Powell and managed to experience all that. So, make sure to plan a weekend trip here if you live in the area or add a day or two stop in here as part of a larger southwest road trip itinerary! As for where to stay, there are a few hotel options in the area. If you want something near the lake, then you can look into renting a houseboat ON the lake or stay at Lake Powell Resort. We were hosted at the resort there and it’s as close to the lake as you can get without staying ON the water. So, if you want to be right at the lake, this is definitely your best bet! Do keep in mind though, that it’s NOT an upscale resort with lots of fun, fancy resort amenities. The rooms was fine for our family of 5, but it was definitely “no frills”. And, you’ll pay extra if you want a lake view. There are multiple restaurants on site, a very large gift shop, a coffee shop, and an area to book your boat tours on the lake, which is quite convenient! Have you ever been to Page? 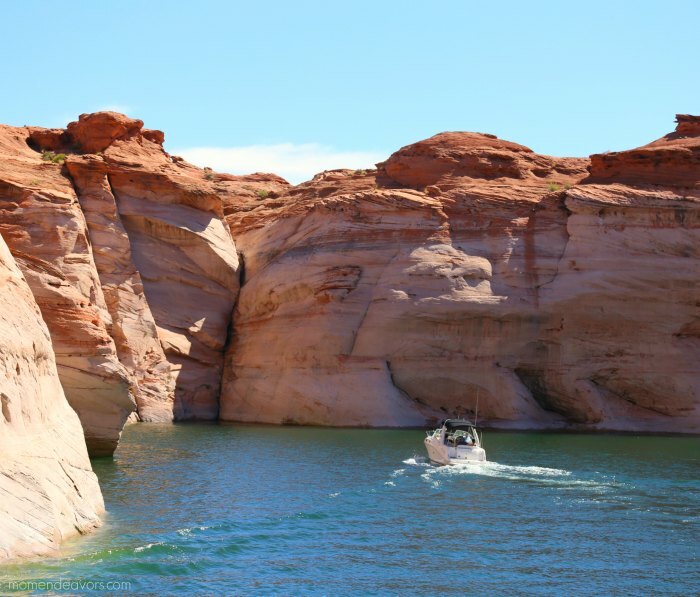 Which of these Page/Lake Powell sights would YOU like best? such great photos! we are going this summer and i can’t wait to see all this beauty in person. coming from philadelphia, it will be a big change in scenery for us! My husband and I also went to Page. 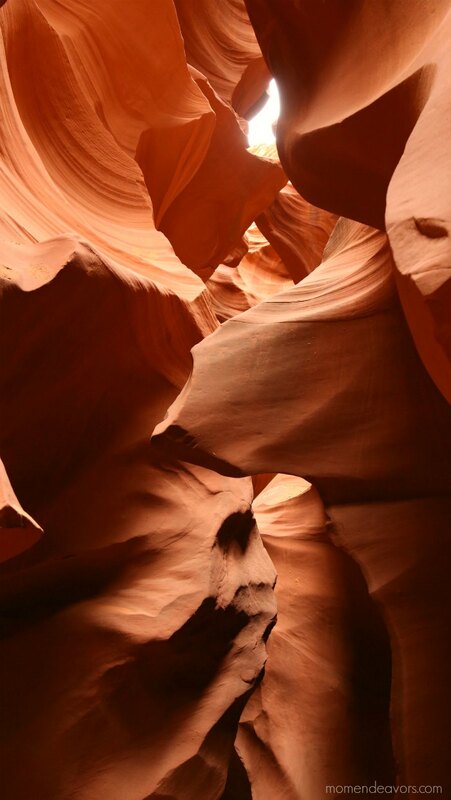 In the Antelope Slot Canyon be aware that you can only get in with a guided tour as it is on the Reservation. If you have never seen a dam, it’s pretty cool. Horseshoe Bend is amazing. But I would also highly recommend a river raft tour. It starts from the dam to Lee’s Ferry. It’s quite a site to see the canyon walls from the water, looking up.